Top of the stretch! Finish line in sight. Effective immediately, please add at least 15 minutes of additional time to your commute to and from campus to compensate for the traffic congestion that will be caused by freeway repairs. These closures will continue for several months, impacting summer school and the coming school year. 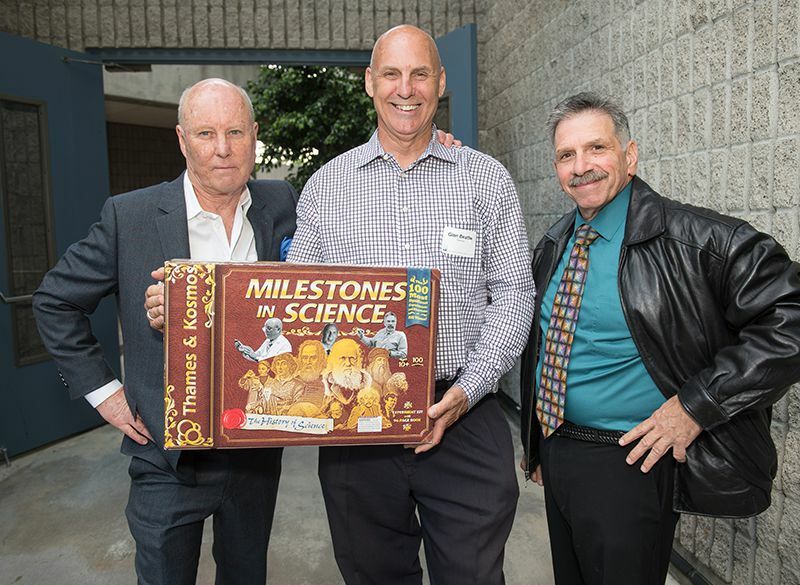 We recently honored retiring teachers Joe Maggio, Glen Beattie and Rob McLinn for their contributions to the Prep Science Department and community as a whole (a combined total of over 100 years!). Click here to watch the tribute video for these three legends of Prep. In addition, we’d love to hear your favorite anecdotes or memories of the three—send them here! Nominees should have five years’ minimum tenure at Flintridge Prep. Nominations cannot be made anonymously (although they will remain confidential). Nominations must include a paragraph of explanation. Any teacher, administrator, staff member, current parent, student or graduate may submit a nomination to the Awards Committee. The Awards Committee consists of the Chair of the Board of Trustees, the Headmaster, the Dean of Faculty, Dean of Studies and the Director of Finance. Awards Committee members may not submit nominations, nor are the committee members eligible for the award. In reaching a unanimous decision, the committee will review the credentials of all candidates to validate the data from the nomination and to consider additional factors including previous awards, testimonials and other appropriate qualitative and quantitative supporting data. The candidates’ contributions throughout their entire Flintridge career will be considered. Recent winners include: Raj Wahi (2016), Madeline Barraclough (2015), Mary Ellen Jamison (2014), Joanna Hartigan (2013) and Sylvie Andrews (2012). The Parents Association Teaching Chair for 2017-2019 is awarded to an outstanding member of the faculty who is widely respected and recognized as an inspirational and superior teacher. Faculty members with full-time status are eligible for this two-year appointment. Administrators and department heads do not qualify. The chair carries an annual stipend of $5,000. Candidates for the chair will be nominated by members of the Parents Association. The appointment will be made by the administration. Criteria will include strength of parent nominations, annual evaluations and previous recognition. Please include one paragraph explaining why your nominee qualifies for consideration. No multiple signatures or petitions, please. Please send an email by May 5, 2017 to pbachmann@flintridgeprep.org. You may also fax your nomination to Margie Woolley at fax (818) 790-1031. If you have any questions, please call Margie at (818) 949-5513. Advanced Placement exams are Monday, May 1 through Friday, May 12. There are exams at 8:00 am and 12:30 pm. Students need to be in the classrooms promptly at 7:45 am and 12:15 pm (with the exception of Spanish Language, which will convene at 7:30 am on Tuesday, May 2). Tests will begin on time. Students who have morning APs are excused from classes the afternoon of the day before their test date, but they must return to class the afternoon of their test. Students who have afternoon APs may miss school the morning of that test date only. Students will be notified of their exam room assignments in class, and the roster will be posted in Chandramohan Library. Please call Midge Kimble at 818.949.5540 if your child is ill during finals and unable to take the exam(s). Mrs. Kimble will reschedule the test. The Chandramohan Library will close at noon during finals, except for Friday, May 26, when it closes at 10:30 am. As the end of the year is quickly approaching and the kids are oh so busy, we would really appreciate your help in reminding your students to return their library books! Please note that if there are any outstanding library books, the students will be unable to receive their yearbooks until their library account is cleared. If you have any questions, please feel free to get in touch with Meryl Eldridge. Thank you! Online registration is underway for the 2017 Summer Session. Register early to get the classes you want. The Parent and Alumni Summer Sessions are back for a sixth year. These lively discussions and learning opportunities are open to alumni, parents and parents of alumni. Discover classes that your kids loved. Finally take a shortened version of that last class you could not fit into your senior schedule. Check your inbox soon for a list of course offerings. The Annual Fund closes on June 30. Special thanks to Christine Son, Sean Stellar and the grade level chairs for their hard work on behalf the school. We thank the 82% of parents who have already contributed and urge the remaining 18% to participate in this historic fundraising initiative. Please email Donna Merchant or call at 818.949.5525 with your commitment or questions. Visit flintridgeprep.org/support to make a contribution. The Dance Department will present "A Night at the Museum" on April 21 and 22 at 7:30 pm in Norris Auditorium. The two performances are different, and admission is free. On Monday, May 1, the Fathers Club and Presenting Sponsor La Cañada Flintridge Country Club will host the Golf Tournament, Silent Auction and Dinner. As in prior years, the net proceeds help fund the Flintridge Prep John Plumb ’64 Endowment Fund, which supports Prep faculty development programs. A special thanks to John Brown, VP Golf Tournament, Bill Bremer, VP Communications and all the volunteer dads and staff members who are assisting in the planning of the annual event. Last chance to purchase golf, dinner and entertainment event tickets! Mark your calendars! The Arts Celebration will be May 17 at 6:00 pm, with many wonderful events—and all of them are free! The event is at Brookside Golf Club. For reservations and details, click here. Please contact Pamela Taylor Gunning or Elizabeth Nesbitt with questions. We hope you can attend the spring coffees. They are a great opportunity to find out what the next year will hold. Parents are invited to attend the coffee for the grade their child will be in next year. All coffees will be at 8:30 am in Miller Theater. On Thursday, May 18, the Fathers Club will host the annual Sports Awards BBQ. All Prep families are welcome to join the springtime gathering in Ahmanson Plaza. Click here for more information. We’re thrilled to celebrate Commencement weekend with the Class of 2017. You can find information about all the activities, dates, times, attire and other details at flintridgeprep.org/commencement. 8th Grade Promotion and Middle School Awards will be on May 30 at 5:00 pm in Norris Auditorium. The event is mandatory for all 7th and 8th grade students. Family and friends are invited to attend the event. Following the ceremony, 8th graders and their families are invited to dinner at La Cañada Flintridge Country Club. Invitations will go out soon. For more information, please call Midge Kimble at 818.949.5540. Seniors: A deposit at the college of your choice must be made by May 1. If you are staying on a waitlist, you must deposit at another institution to which you have been accepted. Students may not submit deposits to more than one college or university. Seniors and their parents are cordially invited to Senior Celebration on Thursday, April 27 at 7:00 pm in Norris Auditorium. This is a celebration to culminate the college process! There will be a photo booth and a DJ to add to the fun. Seniors who have received merit scholarships from the college they are attending and would like the scholarships announced at Commencement should email Ms. Lem (alem@flintridgeprep.org). Juniors: Counselors have begun second meetings with students to debrief college research lists. Meetings with parents also continue. Spring sports are in full swing, with over 200 high school students participating. Teams and individuals look poised to contend for Prep League titles and CIF victories. The boys swim team finished the League schedule undefeated! Teams are faring well in Prep League standings with baseball, softball and volleyball as hopeful title contenders. In Track and Field, we had school records set by Sophie Gitlin in the 3200m and Natalie O’Brien in the 3000m. The distance medley relay team of Sophie Gitlin, Jenna Mijares, Sasha Codiga and Natalie O’Brien also set a new school record. Honored from the winter season: First team ALL-CIF selections in basketball Renae Tamura and Jake Althouse; in soccer, Julia Gonzalez and Helen Schaefer. Come out and support the Prep athletes. Hanna Barakat, Willow Scott and the Athletic Council on Leadership would like to thank everyone for participating in and supporting its first La Mascota 5K Run on March 11 as they raised $13,064 for the children and families in the only pediatric cancer hospital in all of Nicaragua. Take a look at this thank you video. On March 29, the ACL was honored to have Kathy Robinson Young and Delano Robinson as guest speakers to share their story of father and husband Olympic athlete Mack Robinson (placed second in the 100 meters to Jesse Owens in the 1936 Olympics in Germany). Jackie Robinson (#42 of the Brooklyn Dodgers) was Mrs. Robinson Young’s uncle and Mrs. Robinson’s brother in law. Their message to students was to get involved in their community and make a difference in people’s lives as they did through sports. Thank you Riley Coan and Danny Chiarodit for bringing our speakers to the campus. The ACL will host the Special Olympics on Saturday, April 29. If you are interested in volunteering, contact Alex Rivera. 2017-18 ACL applications will be available in the Athletic Initiative office starting on Monday, April 17. The deadline is Thursday, April 27. On Friday, April 7, the Fathers Club hosted the annual New Dads Mixer Reception at Manny and Jane Abascal’s residence. A big thanks to Eric Panajotovic, VP New Dads Mixer Reception, and all dad volunteers for planning the annual welcoming event. The event was attended by over 150 Prep dads and faculty members. Thank you to all the parents who completed the Parents Association survey last month. Your feedback will help us chart the future of Parents Association meetings. Our goal is to provide meetings and events that provide meaningful engagement opportunities that respect your busy lives. Mr. Flintridge Prep was a huge success! We raised $4,500.00 for the Multiple Sclerosis Foundation! Thanks to all the participants for all their hard work and time! Congratulations to all students who performed at the Spring concert this month. It was a heart-warming event, with music provided by the Orchestra and Flintridge Singers. It has been a challenging journey for many of the Speech & Debate team members, with just one weekend to qualify in their specific events to huge tournaments like State Championships or The Grand Nationals in Birmingham, AL. Our district is very competitive, with many teams that qualify, are finalists and are first place winners in for National and State competitions. To qualify involves hard work, dedication and some luck. Some small teams that have been around for over a decade may have one qualifier in that time. With just a year and a half as a competitive team, we have qualified six individuals to Nationals and nine to State for 2017! To qualify for Nationals, students had to be top three in the district. To qualify for State, students had to be top four or five in the district. These kids work so hard, and their hard work pays off. Please tell them congratulations when you can. Click here to see a full list of Speech and Debate recent tournament results. I look forward to seeing you at end-of-year events and celebrations.